An estimated 68,500 daily riders are expected to board the Lynnwood Link trains, which will provide an option to escape some of the nation’s worst highway delays. Construction is slated to be completed in mid-2024. Sound Transit has secured a long sought-after agreement with the Trump administration for $1.2 billion in federal money for the planned 8.5-mile Northgate-to-Lynnwood light-rail line. The agreement between Sound Transit and the Federal Transit Administration (FTA) still must undergo a 30-day congressional review period, but it is highly likely that it will be finalized next month. Sound Transit CEO Peter Rogoff, who previously ran the FTA for five years during the Obama administration, said that in nearly 30 years of monitoring such grants, he’s only once seen an agreement sent to Congress and not get signed. An estimated 68,500 daily riders are expected to board the Lynnwood Link trains, which will provide an option to escape some of the nation’s worst highway delays. Trains from Lynnwood would reach the University of Washington in 20 minutes, or downtown Seattle in 28 minutes. Rogoff said early work contracts for the rail line would likely be approved next month, and construction should begin in early 2019. The rail line is scheduled to be completed in mid-2024. Sound Transit has been counting for years on federal funding to make up nearly 40 percent of the project’s multibillion-dollar budget. The project has long earned high marks from the FTA for its high ridership and the substantial dollars that local residents have committed, but hoped-for federal funding has been on shaky ground since President Donald Trump took office. Trump’s budgets have twice proposed eliminating the program that funds public-transit projects. But Congress has twice ignored Trump’s proposals, passing budget deals that preserve and even increase transit funding. “What this signals on the part of the administration is that rather than push back, they intend to fully follow the direction of Congress and execute these grants,” Rogoff said. 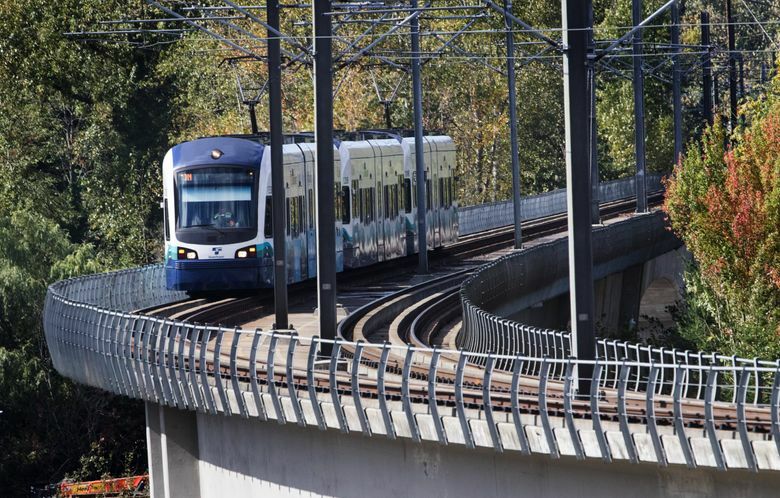 Along with the $1.2 billion grant, the FTA also approved more than $650 million in low-interest, deferred-payment federal loans for Sound Transit to complete the Lynnwood line. The project had already been allocated $200 million in federal funding. Sound Transit would receive the remainder of the funding in installments through 2028. The Lynnwood Link project is the largest of seven Washington transit projects seeking FTA funding. That funding, even for highly rated projects, has lagged for much of the Trump administration. Several months ago, the FTA told Sound Transit that it wasn’t processing any new transit grants, even though Congress had approved the money. And in May, the U.S. Government Accountability Office faulted the FTA for dragging its feet on disbursing grants, noting that the Trump administration had wanted to end the grant program and the FTA “runs the risk of violating federal law” if it doesn’t make changes. Cantwell and Sen. Patty Murray have consistently lobbied the federal Department of Transportation, which oversees the FTA, to free up the funding. In 2017, the cost of the Lynnwood line soared from an estimated $2.4 billion to as much as $3.2 billion, driven by the increasing costs of land and construction in the Seattle area, as well as “scope creep,” with cities along the line seeking more amenities and station land for bus and car access. Voters approved the Lynnwood line in the 2008 Sound Transit 2 initiative, but planning has dragged, with the project’s timeline at least six months behind schedule.